Grow in average, dry to medium, well-drained soils in full sun. Plants generally perform best in sandy or gravelly loams in hot, dry locations. Plants tolerate infertile, poor soils. Good resistance to drought. Plants spread by self-seeding and by stems rooting along the ground at the nodes. Propagate by seed or division in spring. Eragrostis spectabilis, commonly called purple love grass, is a warm season bunchgrass that is native to sandy soils from Maine to South Dakota south to Florida, Texas, Arizona and Mexico. In Missouri, it is found throughout the State, most commonly in sandy, rocky or open ground and along roads, fencerows and railroads (Steyermark). 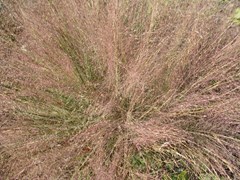 Flat, coarse, mostly basal, green leaves (to 10" long and 3/8" wide) form a somewhat disorganized clump of foliage that typically rises to 10" tall. Soft reddish-purple flowers in a loose, open inflorescence appear in August, forming an airy cloud that covers the grass clump and raises the overall height of the plant to 24" tall. Flowers lose color and turn brown by October. As the seeds mature, the inflorescence usually detaches from the plant and blows along the ground like a tumbleweed distributing seed as it goes. Genus name comes from the Greek words eros meaning love and agrostis meaning grass. Specific epithet means spectacular or showy. Group or mass in borders. Also effective in native plant areas or meadows where it can naturalize. Inflorescence is excellent for dried flower arrangements.